Goal 1 – Develop a detection tool for spores of wood-canker pathogens (aka trunk pathogens), combined with new molecular markers for rapid identification. 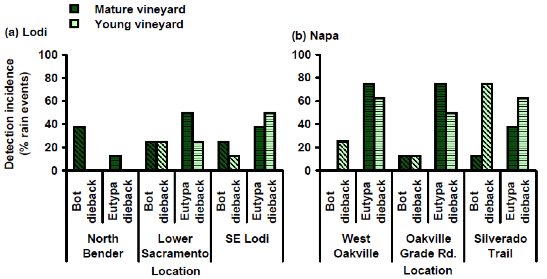 Activities – Evaluated spore traps in young, apparently-healthy vineyards vs. mature, diseased vineyards. 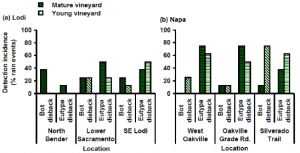 Results & Outputs – Demonstrated that both young and mature vineyards are at similar risk of infection by spores of the same trunk pathogens. Significant Outcomes & Impacts – Growers routinely forego preventative practices in young vineyards because trunk diseases are not a serious problem until year 8. Our results make it clear – disease prevention should be adopted in young vineyards.